However, it the tree is very large with a heavy rootball that’s hard to move, it’s best have it planted professionally. Amending the soil isn’t recommended when planting woody plants, unless there’s no topsoil at all, such as in a new home site where builders haven’t spread nearly enough good soil. In that case, an area far wider than the planting hole should be enriched with plenty of compost and leaf mold. But in most home gardens, it’s better not to amend, so that your tree or shrub gets acclimatized to the soil where it’s growing; otherwise roots can stay in the amended area instead of growing into surrounding soil. Your preferences will play a big role, of course, but your site will dictate which species will do best. Don’t forget the tree’s eventual height and spread, and plan for its size at maturity. If you have a restricted planting area or overhead hydro lines, this will limit the size of the tree you plant. Do some research to find out what trees are best for your soil and moisture conditions and light levels. Staff at a good nursery or garden center can advise on selecting the right trees for your property, as well as give you advice on how to plant a tree. Before getting started, give entire planting area a soaking (the day before so you don’t work in muck) or plant after rain has moistened soil. Dig a hole that is shallow and broad – about three times the diameter of the root ball, but no deeper than the root ball. Most of the roots of a new tree develop in the top 12 inches of soil; digging a wider hole and loosening the surrounding soil allows growing roots to push through more easily. Don’t plant too deeply. The flare where the roots spread at the base of the trunk should be just above the soil level. It’s better to plant a little high to allow for settling. Always lift the tree by root ball, not trunk. 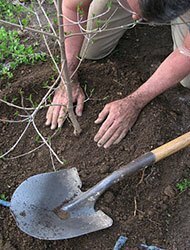 Before you fill the planting hole with soil, look from several directions to check that tree is straight. For container grown trees, remove plastic pot as close to hole as possible to minimize root disturbance. With fiber containers, place tree in planting hole, then tear off upper rim of container and use a utility knife to make slashes at the sides to remove pot. Inspect roots; if circling, gently tease apart or they will continue to make circling growth. If difficult to loosen by hand, make four cuts into root mass from the bottom up the sides with utility knife. This promotes growth into surrounding soil. If there is burlap wrapped around the trunk to protect the tree during transportation, don’t leave it on, as it will attract moisture and rot and impede growth. Fill the hole about one third full and gently but firmly pack soil around the root ball to eliminate air pockets. Don’t stomp on delicate roots. Water to moisten soil; then fill hole completely. Water well after planting, but don’t apply fertilizer until second growing season. If you don’t get regular rainfall, continue to water newly planted trees thoroughly (an inch of water once a week), in the first season. Apply a two- to four-inch layer of mulch (shredded pine or cedar mulch) to soil at tree base in a 3-foot circle. This helps conserve moisture, reduces competition from grass and weeds and encourages you to keep string trimmers away from trunk. Don’t heap mulch up against trunk, as this can promote decay. When planting, do minor pruning only to remove dead twigs or branches damaged during shipping or planting. Postpone any major pruning until after a full growing season. How to plant a tree – does it need to be staked? Contrary to popular opinion, most trees don’t require staking. In fact, recent studies have shown that young trees develop stronger trunk and root systems and establish more quickly if they are not staked. If you must stake because your site is very windy, use a wide flexible material for tying, as shown in the diagram above, so as not to damage bark. Always remove stakes and ties after the first growing season.